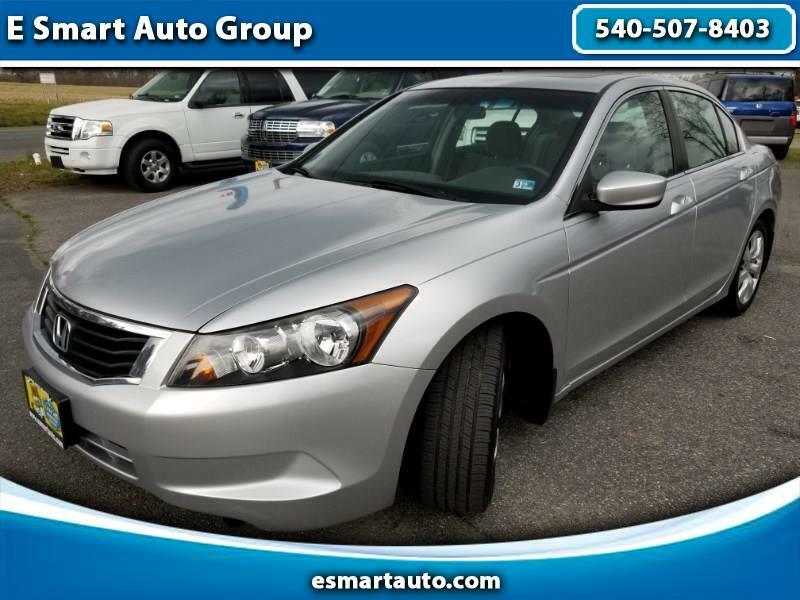 2008 Honda Accord EX, LOW MILES, a clean vehicle from the inside and out! Performs and handles very well. Drives and shifts smooth. WE ONLY SELECT BEST CONDITIONED CARS. We will sell only the reliable and dependable car. Low mark up the high volume! Make your first stop your last at E SMART AUTO! This vehicle comes with 90 days 4500 miles powertrain warranty service contract. CARFAX is the #1 trusted provider of vehicle history information in North America, and we are proud to be a CARFAX CERTIFIED dealer. Each vehicle that we sell comes with not only our assurance of satisfaction but is also guaranteed to have a clean title history by CARFAX. Visit E Smart Auto Group online at esmartauto.com to see more pictures of this vehicle or call us at 540-507-8403 today to schedule your test drive.This vehicle is subject to prior sale. The pricing, equipment, specifications, and photos presented are believed to be accurate, but are provided AS IS and are subject to change without notice. Any payment or financing offer is with lender approval pending a credit check of the borrower. All prices and payments indicated do not include sales tax, vehicle tag/title/registration fees, or processing fee. Please see a salesperson with any questions you might have before making any purchase commitment on this or any other vehicle we have for sale. Visit E Smart Auto Group online at esmartauto.com to see more pictures of this vehicle or call us at 540-507-8403 today to schedule your test drive. Terms of Sale Overview: We reserve the right to end this listing at anytime should the vehicle no longer be available for sale and sales prices are subject to change without notes. This vehicle is subject to prior sale. The pricing, equipment, specifications, and photos presented are believed to be accurate, but are provided "AS IS" and are subject to change without notice. Fuel economy figures (if shown) are provided from EPA mileage estimates. Your actual mileage will vary, depending on specific options selected, overall condition of the vehicle, and your personal driving habits. Any payment or financing offer is with lender approval pending a credit check of the borrower. All prices and payments indicated do not include sales tax, vehicle tag/title/registration fees, or processing fee. Please see a salesperson with any questions you might have before making any purchase commitment on this or any other vehicle we have for sale. These set prices are based on a one time payment in full with your own bank check, cashier check, credit card or cash. Deposits and/or down payments for our cars to hold for more than 24 hours is non-refundable. In case of human error please confirm pricing and equipment with us when we speak. Fees and Taxes: All vehicles sold are subject to a $399 dealer processing fee. This represents the costs incurred with inspecting, cleaning, and adjusting vehicles. This fee also covers preparation of all documents, as well as all costs incurred with shipping of paperwork. Buyers are responsible for all state, county, city taxes and fees, as well as title/registration fees in the state that the vehicle will be registered. Accepted Payment Type: Cash, certified check,Credit Card, Debit Card, bank transfers, EFT or 3rd-party financing DISCLAIMER: THE DEALERSHIP IS NOT RESPONSIBLE FOR TYPOGRAPHICAL ERRORS, MISPRINTS ON PRICES OR EQUIPMENT. ONLINE PRICES REFLECTS REBATES & DISCOUNTS. SPECIAL INTERNET PRICING IS BASED ON ONE TIME PAYMENT OF CASH, CERTIFIED FUNDS, MONEY ORDER AND EFT's. TOTAL PRICES ON VEHICLES FINANCED MAY VARY. WE FINANCE PEOPLE WITH ALL TYPES OF CREDIT.